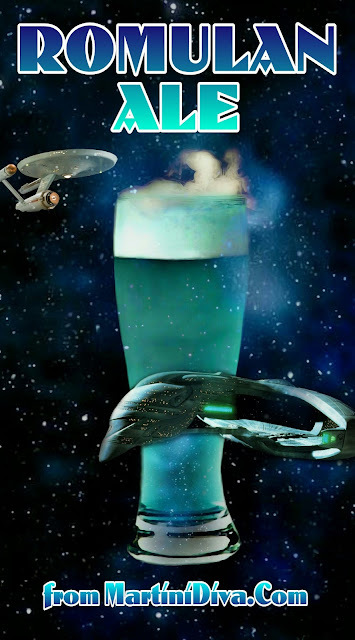 Star Trek's ROMULAN ALE done right - with ALE! In the Star Trek universe Romulan Ale (aka Kali-fal) is the king of cocktails and is referred to throughout all iterations of the franchise. According to the Romulan Tutorial Missions it is said to be produced on the Romulan colony Virinat and is brewed from honey-like secretions of khellid insects whose exoskeletons give the Romulan Ale it's distinctive blue color. Another source claims it's distilled from a harsh grain called kheh. It is blue, it is seriously overproof, it is illegal throughout the Federation and it is also said to cause instant drunkenness and a warp corp breach sized hangover. Despite it's illegality it is a favorite tipple of Captain James Tiberious Kirk, often gifted him on special occasions, usually by Scott and McCoy. Kirk: "Romulan ale? Why Bones, you know this is illegal." McCoy: "I only use it for medicinal purposes." Its said the Romulans themselves drink it solely to prove they can. The Romulan's cousins, the Vulcans, leave it alone. Even the Klingons respected Romulus Ale. Worf, after Troi and Riker's wedding: "Romulan ale should be illegal" Geordi La Forge: "It is." For some reason, I left it off both my Star Trek 1 and Star Trek 2 cocktail recipe posts. I must have been exposed to some alien neurotoxin. I correct that grievous error right now. There are numerous recipes for Romulan Ale out in the universe, not one of which uses any form of ale, beer OR malt liquor. This is just Tribble level nonsense, how can you call it ale if there's no ALE or BEER or MALT LIQUOR? There is blue ale here on Earth, Abashiri Okhotsk Blue Ryuhyo Draft by Abashiri Beer being one of them, but it's made from seaweed and not nearly high enough proof to sub for Romulan Ale. So, since Romulan Ale is not available - still - on Earth or anywhere in the Federation of Planets, you're going to have to make your own and below is the recipe. Think of it as a high powered, alien version of a Shandy. Fair warning: If you're still living in the 21st century and have no access to medical care, or Synthahol, you might just want to just skip the Everclear. Garnish: What garnish? Romulans don't need no stinkin' garnish! Glass: Some kind of beer glass that won't melt on contact with corrosive liquids. DIRECTIONS Shake the Blue Curacao and Everclear with ice then strain into the glass. Top off with the Q.C. Lemon Shrub. Drop in a large chunk of dry ice to make it bubble, but be careful to warn people that dry ice is nearly as dangerous as this Romulan Ale recipe. Serve. Hide the car keys. Nobody's going to be driving anywhere for a while. * Everclear also has a 191 proof version, which would probably get you closer to true Romulan Ale deadliness, but who are we kidding here? The official Star Trek Day is September 8th, celebrating the first television broadcast of the original Star Trek series. First Contact Day is April 5th which commemorates first contact with an alien species within the Star Trek universe.